The WCC Executive Committee has issued a statement expressing concern over the ways in which church institutions and properties in Jerusalem are threatened as a result of contracts of disputed legality, the efforts of radical settler groups, and policies of the government of Israel. For decades, the tourist industry in the Holy Land has been dominated by Israeli tour operators who rely mostly on Israeli hotel owners and land arrangement providers. Visiting Palestinian territories is seldom prioritized and excursions rarely take Palestinian perspectives into account. Most visitors are thus not provided opportunities to familiarize themselves with everyday life of the Palestinian people. In spite of a seemingly bleak outlook for a solution to the conflict in Palestine and Israel, religious leaders all over the world persist in their advocacy for justice and peace in the Holy Land. That became evident at the WCC peace consultations in Beit Sahour this summer, where 60 leaders and representatives from Christian churches and faith-based organizations around the world gathered to manifest their support for a peaceful end to the occupation of Palestinian territories. As the statements calling for justice in Cremisan Valley fail to work, churches urged the international community at the 36th Session of UN Human Rights Council for action regarding the occupied territories between Jerusalem and Bethlehem. From Geneva to Bethlehem and across the world, the World Council of Churches (WCC) World Week of Peace in Israel and Palestine inspired gatherings for prayer, reflection and action last week. Among the commemorations, a group gathered on 22 September at the Wi’am: The Palestinian Conflict Transformation Center in Bethlehem to pray for peace. From a photo “exhibition of hope,” to worship resources, to an opportunity for people and churches to share their personal expressions of hope, the World Council of Churches (WCC) is offering an invitation and accompanying resources to celebrate the World Week of Peace in Palestine and Israel on 17-24 September. On Monday, 18 September at 10:30, an exhibition of hope for justice and peace will open at the Ecumenical Centre in Geneva amid a global ecumenical gathering of 45 representatives from all over the world. 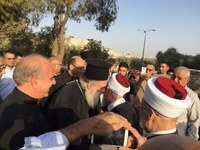 In a statement released the first week of September, the patriarchs and local heads of churches in Jerusalem condemned further encroachments on the status quo related to the city's holy sites. The text is the second statement of concern in three months about the status quo, with a prior one issued in July. On 27 July, Bishop Munib Younan of the Evangelical Lutheran Church in Jordan and the Holy Land received the Niwano Peace Prize for his work towards interreligious dialogue among Christians, Muslims, and Jews in Jerusalem and worldwide. Muslims and Christians were gathered together in Al Aqsa Mosque in Jerusalem on 27th July. Side-by-side for just peace in the Holy Land. After almost two weeks of tension, violence and killings in Jerusalem. Meetings between church leaders and the Islamic leadership inside the mosque plaza were cheered by the community even amid wafts of tear gas and the rumble of explosives from time to time. Catholic Patriarch Emeritus Michel Sabbah, who was supposed to be heading the Christian delegation, was denied entry through Lions’ Gate and, instead, sent his message. The World Council of Churches (WCC) is calling for global prayers tomorrow for just peace in the Holy Land, and for all barriers to places of worship to be removed. On 5 July, the first Syrian and Iraqi refugees arrived legally in France from Lebanon in what marks an expansion of the Humanitarian Corridors project founded by by the Federation of Protestant Churches in Italy (FCEI), the Sant’Egidio religious community and the Italian government. For the sake of peace, church leaders in Jerusalem are calling to maintain the historical status quo on the historical designation allowing access to al-Aqsa Mosque and its courtyard, as well as other Holy Sites in the city. Last week, young Jewish, Muslim and Christian students learned about communication and peacebuilding during a workshop at the Ecumenical Centre, all with the hope of serving as peacemakers in their own contexts. 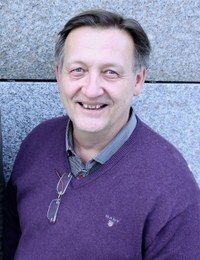 The session was led by Marianne Ejdersten, director of WCC Communication. 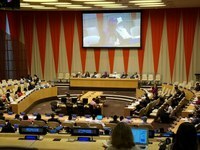 The first ever action plan specifically designed to enable religious leaders to prevent incitement to violence - the Plan of Action for Religious Leaders and Actors to Prevent Incitement to Violence that Could Lead to Atrocity Crimes - was launched on 14 July by Secretary-General António Guterres at a meeting at United Nations Headquarters in New York. 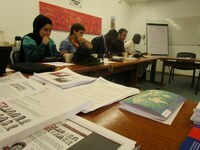 As young people earned an interreligious studies certificate at the World Council of Churches Bossey Institute, they completed their three-week course with unified thoughts on promoting peace. In a communique issued on 13 July, they identified themselves as Jews, Christians and Muslims - children of Abraham - with a unique openness. For Dr Vahid Sohrabifar from Iran’s city of Qom, attending the Certificate of Advanced Studies in Interreligious Studies at the Ecumenical Institute in Bossey was inspiring due to the diversity he encountered on the course. 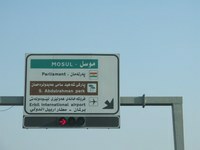 In the wake of official announcement of Mosul’s liberation from the so-called ‘Islamic State’ (IS) group, World Council of Churches (WCC) general secretary Rev. Dr Olav Fykse Tveit called for a commitment to restoring the social and religious diversity of the city and region. 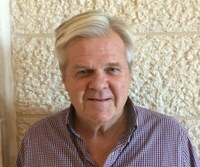 As a retired person in his late 60s, Frederick “Fred” Rainger often asks himself: ”what can I stop doing?” His days are filled with engagements in community activities and it hasn’t gotten any less busy since he became more involved in the Palestine Israel Ecumenical Network (PIEN), a network of Australian Christians seeking lasting peace for the people of Palestine and Israel. Around 60 participants from Christian churches all over the world gathered in Beit Sahour for peace consultations two weeks ago.